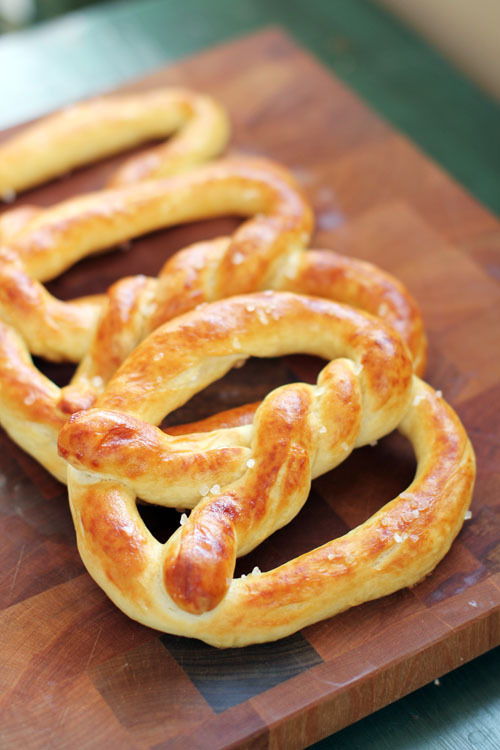 I cobbled this recipe together from many different recipes, with especially helpful tips coming from this video series by Auntie Anne's. In a large bowl or the bowl of a stand mixer, mix yeast and 1¼ cup warm water. Let sit for 2 minutes. Add brown sugar, bread flour, self-rising flour and vegetable oil to the yeast and mix to combine completely. Knead on a lightly-floured surface until you have a nice ball of dough. If you're using your stand mixer, knead with the dough hook for a few minutes until a ball forms. You do not want to over-knead the dough. If you're using your stand mixer, remove the dough hook and cover the bowl with a clean towel or cloth. If you knead the dough by hand, place in a greased bowl and cover with a cloth. Let rise for 45 minutes, until just about double in size. Clean your countertop well. Spray some non-stick oil spray onto a small part of your counter off to the side and dump your dough ball out onto that greased part of the counter. 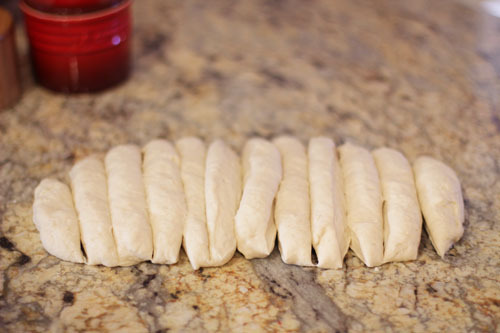 Form a uniform rectangle and then cut the dough into 12 equal pieces. To form the pretzels, pick up a piece of dough and roll/stretch it out into a long thin rope on the un-greased portion of your countertop. You want the rope to be quite long, about an arm's length, and quite skinny. 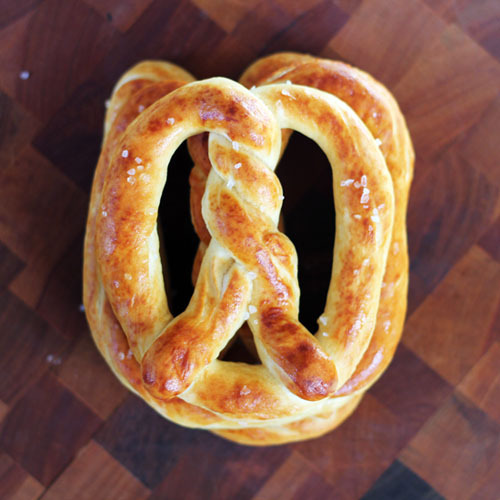 Make a U shape with the dough, then lift the two ends and twist them around each other twice, then attach the two ends at the bottom of the U to form the pretzel shape. Click here to see a video demonstration. 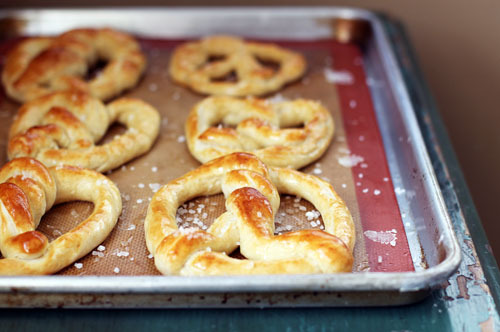 Bake for 5-10 minutes, until pretzels are a dark golden brown. Brush with melted butter and sprinkle with rock salt. 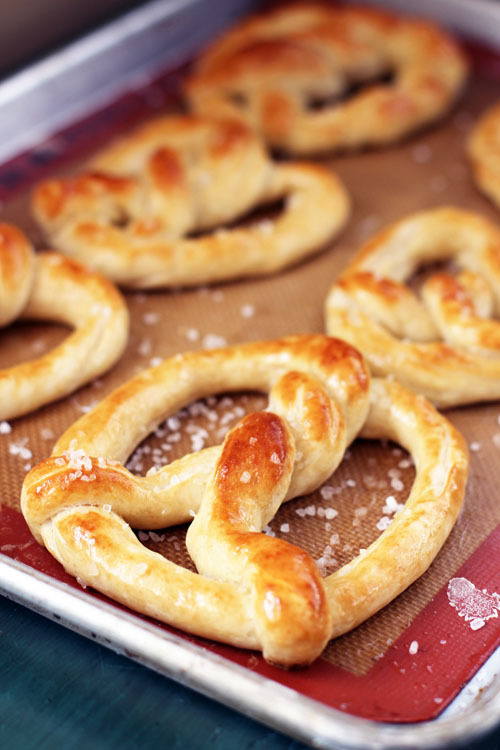 If you want to make cinnamon-sugar pretzels, dip the cooked pretzels completely in butter then coat in cinnamon sugar. Best served fresh out of the oven. Leftovers can be reheated in a 325º oven for about 4 minutes. You have the magic touch for working with dough, Jane. These are incredible! I love that you got the kids in the kitchen, too. magic touch or just luck! 😉 it was a lot of fun putting them together! thanks for your sweet comment! How fun! And they look delicious. I showed my son these pics already and we are excited to try making them! I hope you give it a try – I’m sure you would have fun!! can i come over now and get one? next time we’ll try to save you one…but it will be hard. they were gone FAST! These are perfection. I have to go watch those videos and then make these with the kids! 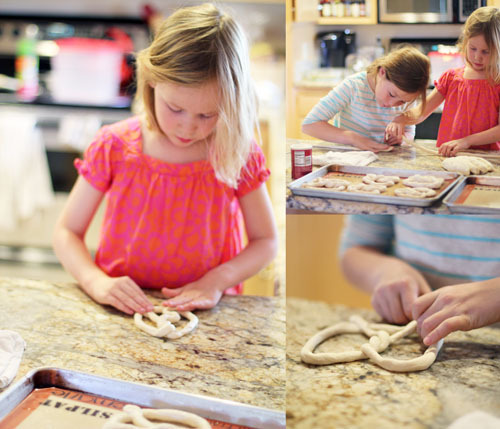 you and your kids would rock making pretzels. I just know it! I have a huge weakness for pretzels! Them Amish really know how to make everything taste that much better. There’s an Amish community about an hour from where I live, and visiting them always results in a delicious trip. These look amazing! Ok seriously?? These look amazing!!! BLASPHEMY! There are NO BETTER pretzels than the NYC vendor pretzels!! 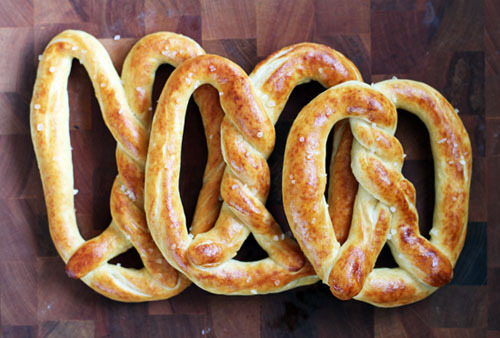 I have been making pretzels for my entire, plus extended, family for many years. My recipe is almost exactly the same. But instead of basting them in hot wanter and baking soda, which I tried originally, I boil them for a few minutes in a mixture of baking soda and water, then i baked themto a golden brown… They turned out far better, simply amazing flavor, You’ll be pleasantly surprised at the difference. I am SO going to try that! I can only imagine how wonderful the boiling step must make them (thinking about those east coast bagels right now! )….thank you for your comment!! Branden, curious about how to boil them without them losing their shape. Do you boil them in a shallow pan? or pot? how long? and how do you get them out? In a Dutch oven, bring water and baking soda to a boil. Drop pretzels, two at a time, into boiling water. Cook 30 seconds. Remove with a slotted spoon; drain well on paper towels. These were absolutely amazing. My twisting skills aren’t the best but who cares when they taste this good!! I meant to give 5 stars! I am making these as we speak! I can’t wait to see how they turn out! They are great!! My husband thought so too!! Thanks for the recipe! awesome! thanks for reporting back!! Can these be made ahead of time, stuck in the fridge and cooked to serve? Hi Chris! Great question! I personally have not frozen these, but I think this dough would be a great candidate for freezing! 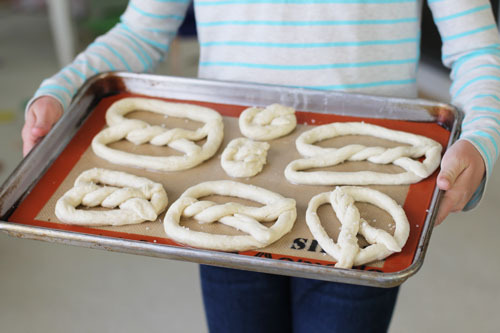 I would freeze them BEFORE the baking soda wash step and save that for when you actually bake the pretzels. I would also probably let the pretzels defrost at room temperature for 30-60 minutes before baking, but I’m just guessing on that number since I haven’t done it myself If you do try freezing, let us know how it goes! I made this recipe topping them with cinnamon sugar instead of salt, and sent them to work with my spouse who shared them with the other wind techs… they were a huge hit and everyone has been begging for more ever since! Delicious! 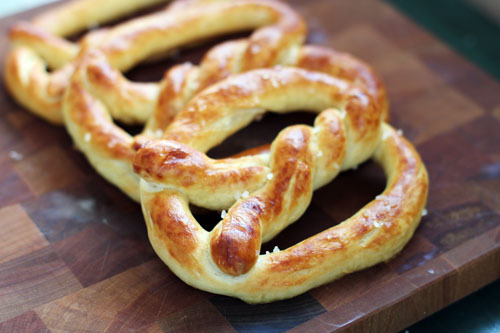 I made these tonight, wanting to find a pretzel recipe similar to what we get at our local hockey games! These turned out great! One note: when pinned, an ingredient list shows under the picture, but the self-rising flour is left off. I made these. They were easy and tasted great. Do you have any flour recommendations for making them gluten-free? hi kim, so glad you liked the recipe! I have only ever made on gluten-free recipe ever, so I haven’t the foggiest idea what would work! sorry about that! im worried that because I’m not a great twister that they won’t turn out right. does it matter the shape? I’m really looking forward to making them though! i read amish novels on a daily basis and i love all their recipes so I’m excited about trying this one!!!! first off, don’t stress! they do not have to be twisted perfectly and I really think you’ll be able to do it! and, honestly, I am not sure if you HAVE to do it in this shape…I’ve never seen them any other way, so maybe there is a reason for it. I think one thing about it is that they’ll stay together better…but you could maybe try doing short pretzel rods or something. Hi Jane, We just got back from a visit to Pennsylvania and can’t wait to try these! The reason they’re in this shape is they’re supposed to look like a child crossing his arms in prayer. Crunchy pretzels were made in this shape by monks centuries ago – maybe given as treats when children learned their prayers? that is so cool! thank you for sharing, Susanna! Hey Jane!!! I made these not to long ago! And Omggg they are amazing !!!! I am going to upload them to my Instagram and i will be sure to tag you in the pic !! Thank you for this fabulous recipe ! WOOHOO! SO happy you loved them!! These were amazing. I boiled them in the baking soda water solution for about 45 seconds. I also basted with an egg wash mixture to give it that yummy brown exterior. so so so happy you loved them, and love the tips you shared. thank you!